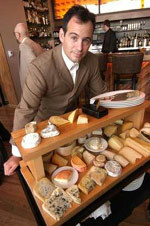 Andrew Steiner, former "Maitre Fromager" at Patina (Cheese Master — now there&apos;s a worthy sobriquet! ), has opened a shop of his own on Montana Avenue in Santa Monica. Andrew&apos;s Cheese Shop is offering over 200 varieties of cheese, including many hand-crafted and artisanal varieties from all over the globe — even raw milk cheeses! Andrew highlights cheeses like the Chimay Grand Cru (yes, from the same makers of the potent Belgian ale), Sally Jackson Goat (a nutty American varietal), and Roomano, a Friesian cheese similar to an aged Gouda. But the fun doesn&apos;t stop there — the Cheese Shop will also be holding all manner of special events for those interested in learning more about the stinky stuff. Beginners can start with the weekly "Cheese 101" class, which costs $25 and introduces you to the basics of cheese tasting, preparation, and storage. More advanced fromagers can indulge in the graduate-level class, which will be on offer soon (check their website for updates). There&apos;s even talk of a Cheesy Singles Night, at which patrons will be able to indulge in wine and cheese "to the sounds of 80’s pop and disco". For those of you who don&apos;t have time or inclination to check out the singles scene, Andrew&apos;s will also prepare custom cheese platters for parties and events. They&apos;ll even deliver cheese by bike to customers in the Santa Monica area. The store is open daily from 10am to 7pm; you can reserve class times and find out more at their website: andrewscheese.com, or by calling 310.393.3308.